This eggnog is as decadent as it gets. A trio of brandy, rum and bourbon combined with a dash of vanilla makes this creamy nog off-the-hook delish. Nothing says Christmas like a fire, some holiday tunes and a nip of eggnog…before or after dinner. Some people get a little fritzed up about the safety of eggs in eggnog, but fret not. The eggs are essentially cooked by the booze in this recipe. PS. Oh, and let’s not worry about our waistlines or cholesterol this time of year. We’ll come clean in January! P.S. 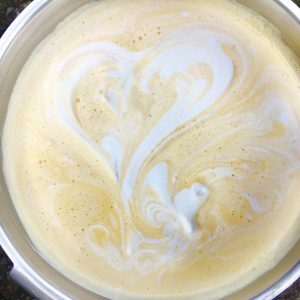 If you are looking for a dairy-free version of eggnog, that recipe is also available on our website. Separate the eggs, placing the yolks in the bowl of a stand mixer or a large mixing bowl. Beat the yolks using the paddle attachment (if using stand mixer) on medium speed for about a minute. Slowly add the sugar and a pinch of sea salt, and beat until the yolks get light in color and are thick and billowy, a couple minutes. Then slowly, VERY SLOWLY, drizzle the booze into the eggs. (If you add alcohol too fast, you will curdle the eggs.) Now, strain the egg mixture into a large bowl, then wash and dry the mixing bowl thoroughly. Add the chilled cream and the vanilla. Using the whisk attachment, beat eggwhites until light and fluffy. Fold the whipped cream into the egg mixture. Now taste… do you feel like you have died and gone to heaven? Wash the mixing bowl super well and dry it. (This is VERY important as you must not have any fat residue in your bowl or your whites will not whisk properly.) Beat the egg whites with a healthy pinch of sea salt until light and fluffy and soft peaks form. (That means it holds its shape and resembles shaving cream). Do not over beat, as the whites will get dry. Now, whisk the egg whites into egg-creamy mixture. Refrigerate over night and up to a week. When ready to serve (or gift), whisk eggnog vigorously to re-incorporate, and thin with milk until it reaches desired consistency. Our Dad does not thin it at all, but we like it a little thinner. Hit it with more booze if you dare and top with a little fresh grated nutmeg if you wish. Note: Fans of Penzey Spices, we order beautiful, plump, whole Madagascar vanilla beans online. We store them indefinitely in a glass jar in the refrig, submerged in brandy or rum. Note: This recipe must be made at least one day in advance and refrigerated, before serving.